Britain's Prime Minister Theresa May leaves No. 10 Downing St. to attend the weekly Prime Ministers' Questions session on Wednesday. Anti-Brexit campaigners wave the Union Jack and European Union flags outside the Houses of Parliament on Wednesday. The United Kingdom is embroiled in its biggest political crisis in decades. On Wednesday evening, members of Parliament in Prime Minister Theresa May's own Conservative Party are casting ballots in a no-confidence vote over her leadership. May needs to win a simple majority of votes from her party's parliamentarians to keep her job. Why do members of the prime minister's own party want to sack her? 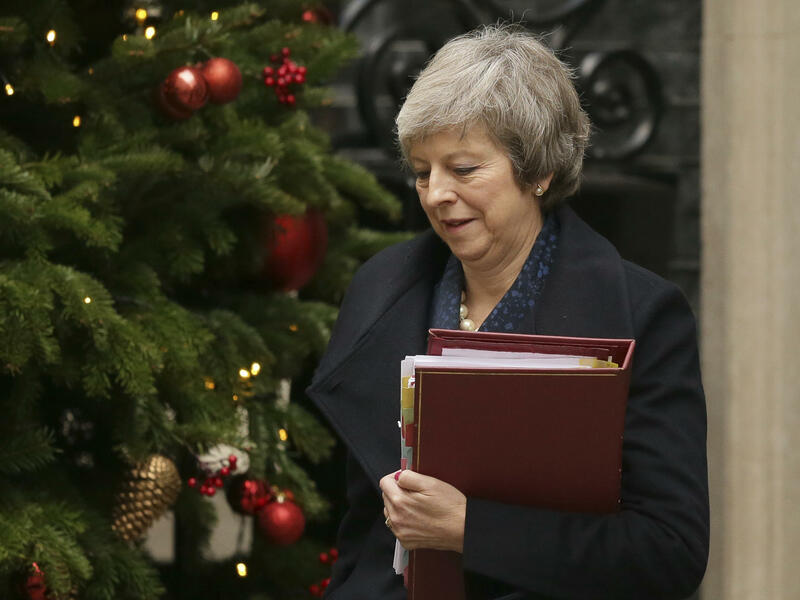 The ballot, which could topple the prime minister, comes two days after May canceled a vote in Britain's House of Commons on her deeply unpopular Brexit withdrawal agreement. 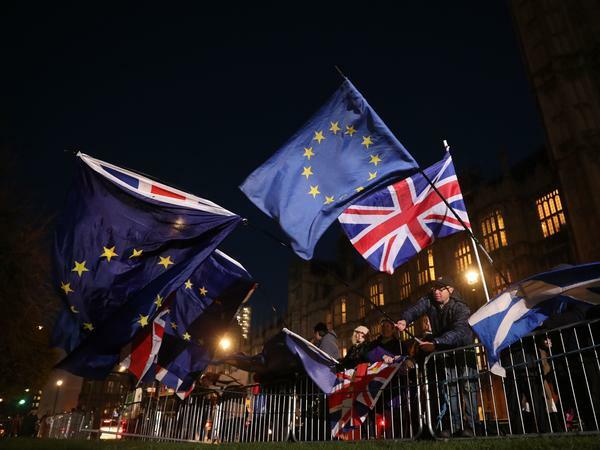 The deal, which many critics see as potentially threatening the integrity of the United Kingdom, was expected to fail by a large margin. Conservative members of Parliament have urged May to press the European Union to reopen negotiations on the deal, but the EU has refused. May's critics say she has failed to deliver on Brexit. "For the sake of the Conservative Party and indeed for our country's destiny, I honestly believe that [it] is now time to seek fresh leadership that can carry this country forward outside of the European Union and confidently into the world," said Mark Francois, a Conservative who said he was among the 48 or more who submitted letters calling for the no-confidence vote. The prime minister insists she has obtained the best deal the European Union is willing to give — and that a new prime minister won't fare any better. "A leadership election would not change the fundamentals of the negotiation or the parliamentary arithmetic," May said in the House of Commons on Wednesday. "Weeks spent tearing ourselves apart will only create more division just as we should be standing together to serve our country. None of that would be in the national interest." What happens if the no-confidence vote succeeds? What happens if it doesn't? If the no-confidence vote fails, May will continue as leader of her party and as Britain's prime minister, secure in the knowledge there cannot be another challenge to her leadership of the party for at least another year. If the no-confidence vote succeeds, then the ruling Conservative Party will have to choose a new leader. (May will stay on as a member of Parliament). The winner of that contest, as leader of the largest party in Parliament, will be invited by Queen Elizabeth II to form a new government. If that attempt to form a new government fails, then it will be the turn of the opposition Labour Party to try. If neither party succeeds, there will be a new general election. What is the key dispute in May's Brexit withdrawal deal? The agreement covers everything from future police cooperation to the U.K. paying a nearly $50 billion "divorce" bill. The biggest sticking point, however, has been how to avoid building new customs posts on the island of Ireland. Northern Ireland, which is part of the U.K., and the Republic of Ireland are currently still inside the EU's single market, so there's no need for barriers along a border extending more than 300 miles. Both the U.K. and the EU have insisted there will not be a "hard" border since free movement was an important part of the 1998 Northern Ireland peace agreement. After the U.K. leaves the European Union, Northern Ireland and the Republic of Ireland will be in two separate economies, requiring customs monitoring. No one has come up with a credible way to avoid a hard border, so the deal calls for Northern Ireland to stay in a customs arrangement with the EU until both sides can figure out a solution or work out a new free trade agreement. Many members of Parliament oppose this because they say placing Northern Ireland in a closer economic relationship with the European Union damages the unity of the United Kingdom. Even worse, they say, the U.K. would have no unilateral right to pull out of the customs arrangement, so it could endure for years. Is May's withdrawal agreement better for Britain than staying in the EU? Many say the conditions under the prime minister's deal are worse. When politicians argued for Brexit, they insisted the U.K. would take back control of its laws and regulations from Brussels, home of the European Union. Under the withdrawal agreement, the U.K. could remain in a customs arrangement for who knows how long — free trade deals can take years — while giving up its power as an EU member to shape the rules under which the European Union operates. Why does this all ultimately matter? Why should anybody outside Britain care? A disorderly Brexit undermines the cohesion of the European Union, which was set up to create prosperity and ensure peace after two world wars. The United Kingdom is America's closest political ally. The countries are democracies, share a common language and their soldiers have fought side by side in Europe and Afghanistan. A key ally in political chaos is not helpful for the United States as it grapples with an increasingly challenging global landscape that includes a resurgent Russia and an increasingly assertive China. Producer Sam Alwyine-Mosely contributed to this report.